Cape Town - During the 2016/17 financial year the Cape Town Central City Improvement District (CCID) enabled just over 1 000 arrests, issued more than 17 000 fines to the value of about R11.5m, conducted more than 100 000 crime prevention initiatives and assisted at more than 700 motor accidents. The CCID furthermore, cleaned more than 20 000 drains during the financial year, cleaned more than 3 000 storm water drains, replaced 180 drain covers, removed more than 3 000 illegal posters and removed more than 3 000 incidents of graffiti. The organisation's social division engaged with almost 6 000 street people and helped almost 300 people to go to shelters. More than 100 people were helped to go home in an attempt to reunite them with their families. In 2016 the CCID joined the Rockefeller Foundation’s 100 Resilient Cities programme, vowing to implement and adapt its own programmes as far as possible to ensure the future resilience of the Mother City’s CBD. The CCID said at its AGM on Monday that it has achieved its 17th clean audit in as many years of existence. CCID chairperson Rob Kane emphasised the seven qualities an urban environment needs to develop. According to the Rockefeller programme, these are the abilities to be reflective and learn from experience; be resourceful; be inclusive; be integrated; be robust; have the spare capacity to deal with disruptions and have a willingness to adopt new strategies in response to changing circumstances. According to the CCID's CEO Tasso Evangelinos, it is import for city improvement districts to identify their resilience priorities. In terms of public safety and security, challenges could include crime, drug and alcohol abuse, and traffic congestion, while in terms of urban management, challenges could include ageing or inadequate infrastructure, climate change and water insecurity. For social development, challenges such as homelessness, poverty and youth disenfranchisement were front of mind. There were also general communications challenges in terms of educating the public on crime prevention, the promotion of investment and diversification of the economy, the call for creating social cohesion and changing mindsets around sustainability and the use of resources. Evangelinos noted how the experiences of the CCID could also benefit other communities throughout Cape Town. "You can’t begin to plan for future resilience, if you don’t have the basics in place and if you don’t have the hard facts, figures and numbers to back up what it is you do. It’s in the assessment and constant maintenance of these basics, that you are then able to plan and adapt for the future, and go beyond what you do on a day-to-day basis,” he explained. “Apart from the very important role our public safety officers play 24/7, are the tasks performed while many of us are sleeping in our beds at night. For example, the clean up of the Central City that happens during the late-night hours by our professional J&M cleaners, as well as by our Straatwerk dawn patrol in the early hours of the morning." He emphasised that, were it not for these dedicated teams, the central city would look very different in the morning when office workers enter the city. "This is due, not only to the clean up that needs to happen after people have been partying or as a result of events that take place at night, but to the high volumes of illegal dumping that regularly occur when culprits take their chances,” he said. 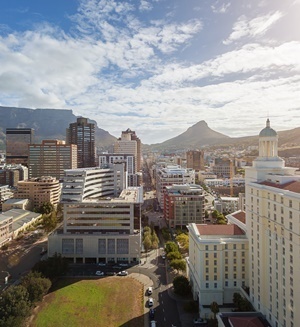 CCID projects include a pilot project, involving St Georges Mall and Greenmarket Square, being run in conjunction with the City of Cape Town to revitalise public spaces across the metropole. Another project is one with which the CCID's safety and security department has been involved - a student ambassador pilot project run in The Company’s Garden. The project is funded by the Western Cape Government Department of Community Safety (DOCs) and deploys students from its Chrysalis Academy on a day-to-day basis – 25 at a time for up to nine months at a time. "Along with their visible presence on the ground and a resultant drop in crime in The Company’s Garden, the work experience which the students receive has enabled many of them to move on to permanent jobs. Because of the overall success of the programme, the CCID is now in talks with DOCs to see how this could potentially be rolled out as an ambassador programme to other areas in the Central City," according to the CCID. As for its traffic congestion programme, the CCID has deployed six CCID-funded traffic wardens from the City’s Traffic Services Department to work with six of the City’s own wardens. These 12 officers primarily deal with traffic congestion at major intersections across the CBD during peak hour traffic in the afternoon. "A first for South Africa, the six CCID-funded traffic wardens have also been equipped with the same body-worn video units that the CCID’s own public safety officers wear, and this has had a significant impact on behaviour modification among motorists," said the CCID.